Of all the places in all the world where no one in their right mind would build scores of nuclear power plants, Japan would be pretty near the top of the list. The Japanese archipelago is located on the so-called Pacific Rim of Fire, a large active volcanic and tectonic zone ringing North and South America, Asia and island arcs in Southeast Asia. The major earthquakes and active volcanoes occurring there are caused by the westward movement of the Pacific tectonic plate and other plates leading to subduction under Asia. Japan sits on top of four tectonic plates, at the edge of the subduction zone, and is in one of the most tectonically active regions of the world. It was extreme pressures and temperatures, resulting from the violent plate movements beneath the seafloor, that created the beautiful islands and volcanoes of Japan. Nonetheless, like many countries around the world — where General Electric and Westinghouse designs are used in 85 percent of all commercial reactors — Japan has turned to nuclear power as a major energy source. In fact the three top nuclear-energy countries are the United States, where the existence of 118 reactors was acknowledged by the Department of Energy in 2000, France with 72 and Japan, where 52 active reactors were cited in a December 2003 Cabinet White Paper. The 52 reactors in Japan — which generate a little over 30 percent of its electricity — are located in an area the size of California, many within 150 km of each other and almost all built along the coast where seawater is available to cool them. However, many of those reactors have been negligently sited on active faults, particularly in the subduction zone along the Pacific coast, where major earthquakes of magnitude 7-8 or more on the Richter scale occur frequently. The periodicity of major earthquakes in Japan is less than 10 years. There is almost no geologic setting in the world more dangerous for nuclear power than Japan — the third-ranked country in the world for nuclear reactors. Last summer, I visited Hamaoka nuclear power plant in Shizuoka Prefecture, at the request of citizens concerned about the danger of a major earthquake. I spoke about my findings at press conferences afterward. 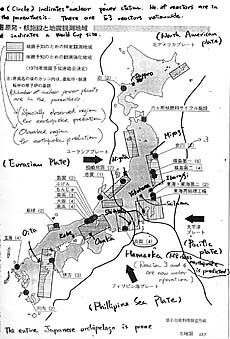 Because Hamaoka sits directly over the subduction zone near the junction of two plates, and is overdue for a major earthquake, it is considered to be the most dangerous nuclear power plant in Japan. Together with local citizens, I spent the day walking around the facility, collecting rocks, studying the soft sediments it sits on and tracing the nearly vertical faults through the area — evidence of violent tectonic movements. The next day I was surprised to see so many reporters attending the two press conferences held at Kakegawa City Hall and Shizuoka Prefecture Hall. When I asked the reporters why they had come so far from Tokyo to hear an American geoscientist, I was told it was because no foreigner had ever come to tell them how dangerous Japan’s nuclear power plants are. I told them that this is the power of gaiatsu (foreign pressure), and because citizens in the United States with similar concerns attract little media attention, we invite a Japanese to speak for us when we want media coverage — someone like the famous seismologist Professor Ishibashi! When the geologic evidence was presented confirming the extreme danger at Hamaoka, the attending media were obviously shocked. 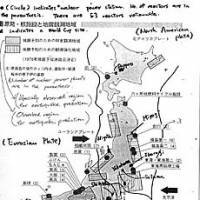 The aerial map, filed by Chubu Electric Company along with its government application to build and operate the plant, showed major faults going through Hamaoka, and revealed that the company recognized the danger of an earthquake. They had carefully placed each reactor between major fault lines. “The structures of the nuclear plant are directly rooted in the rock bed and can tolerate a quake of magnitude 8.5 on the Richter scale,” the utility claimed on its Web site. From my research and the investigation I conducted of the rocks in the area, I found that that the sedimentary beds underlying the plant were badly faulted. Some tiny faults I located were less than 1 cm apart. When I held up samples of the rocks the plant was sitting on, they crumbled like sugar in my fingers. “But the power company told us these were really solid rocks!” the reporters said. I asked, “Do you think these are really solid?’ and they started laughing. After the greatest nuclear power plant disaster in Japan’s history at Tokai, Ibaraki Prefecture, in September 1999, large, expensive Emergency Response Centers were built near nuclear power plants to calm nearby residents. After visiting the center a few kilometers from Hamaoka, I realized that Japan has no real nuclear-disaster plan in the event that an earthquake damaged a reactor’s water-cooling system and triggered a reactor meltdown. Additionally, but not even mentioned by ERC officials, there is an extreme danger of an earthquake causing a loss of water coolant in the pools where spent fuel rods are kept. As reported last year in the journal Science and Global Security, based on a 2001 study by the U.S. Nuclear Regulatory Commission, if the heat-removing function of those pools is seriously compromised — by, for example, the water in them draining out — and the fuel rods heat up enough to combust, the radiation inside them will then be released into the atmosphere. This may create a nuclear disaster even greater than Chernobyl. If a nuclear disaster occurred, power-plant workers as well as emergency-response personnel in the Hamaoka ERC would immediately be exposed to lethal radiation. During my visit, ERC engineers showed us a tiny shower at the center, which they said would be used for “decontamination’ of personnel. However, it would be useless for internally exposed emergency-response workers who inhaled radiation. When I asked ERC officials how they planned to evacuate millions of people from Shizuoka Prefecture and beyond after a Kobe-magnitude earthquake (Kobe is on the same subduction zone as Hamaoka) destroyed communication lines, roads, railroads, drinking-water supplies and sewage lines, they had no answer. Last year, James Lee Witt, former director of the U.S. Federal Emergency Management Agency, was hired by New York citizens to assess the U.S. government’s emergency-response plan for a nuclear power plant disaster. Citizens were shocked to learn that there was no government plan adequate to respond to a disaster at the Indian Point nuclear reactor, just 80 km from New York City. The Japanese government is no better prepared, because there is no adequate response possible to contain or deal with such a disaster. Prevention is really the only effective measure to consider. In 1998, Kei Sugaoka, 51, a Japanese-American senior field engineer who worked for General Electric in the United States from 1980 until being dismissed in 1998 for whistle-blowing there, alerted Japanese nuclear regulators to a 1989 reactor inspection problem he claimed had been withheld by GE from their customer, Tokyo Electric Power Company. This led to nuclear-plant shutdowns and reforms of Japan’s power industry. Later it was revealed from GE documents that they had in fact informed TEPCO — but that company did not notify government regulators of the hazards. Like most whistle-blowers, Sugaoka and Kikuchi are citizen heroes, but are now unemployed. The Radiation and Public Health Project, a group of independent U.S. scientists, has collected 4,000 baby teeth from children living around nuclear power plants. These teeth were then tested to determine their level of Strontium-90, a radioactive fission product that escapes in nuclear power plant emissions. Unborn children may be exposed to Strontium-90 through drinking water and the diet of the mother. Anyone living near nuclear power plants is internally exposed to chronically low levels of radiation contaminating food and drinking water. Increased rates of cancer, infant mortality and low birth weights leading to cognitive impairment have been linked to radiation exposure for decades. However, a recent independent report on low-level radiation by the European Committee on Radiation Risk, released for the European Parliament in January 2003, established that the ongoing U.S. Atomic and Hydrogen Bomb Studies conducted in Japan by the U.S. government since 1945 on Hiroshima and Nagasaki survivors underestimated the risk of radiation exposure as much as 1,000 times. Additionally, on March 26 this year — the eve of the 25th anniversary of the worst nuclear disaster in U.S. history, at the Three Mile Island plant in Pennsylvania — the Radiation and Public Health Project released new data on the effects of that event. This showed rises in infant deaths up to 53 percent, and in thyroid cancer of more than 70 percent in downwind counties — data which, like all that concerning both the short- and long-term health effects, has never been forthcoming from the U.S. government. It is not a question of whether or not a nuclear disaster will occur in Japan; it is a question of when it will occur. Like the former Soviet Union after Chernobyl, Japan will become a country suffering from radiation sickness destroying future generations, and widespread contamination of agricultural areas will ensure a public-health disaster. Its economy may never recover. Considering the extreme danger of major earthquakes, the many serious safety and waste-disposal issues, it is timely and urgent — with about half its reactors currently shut down — for Japan to convert nuclear power plants to fossil fuels such as natural gas. This process is less expensive than building new power plants and, with political and other hurdles overcome, natural gas from the huge Siberian reserves could be piped in at relatively low cost. Several U.S. nuclear plants have been converted to natural gas after citizen pressure forced energy companies to make changeovers. After converting to natural gas, the Fort St. Vrain plant produced twice as much electricity much more efficiently and cheaply than from nuclear energy — with no nuclear hazard at all, of course. It is time to make the changeover from nuclear fuel to fossil fuels in order to save future generations and the economy of Japan.